ROAD TRIP! ecoprintQ and Umango on the road in Florida! | Industry Analysts, Inc.
As an authorized solution center, our resellers and partners are extremely important to us. Our goal is to always provide them with exceptional services and experiences. 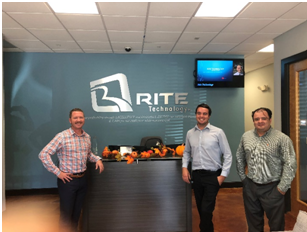 Recently, one of our channel managers, Charles Bernard and umango channel manager Jared Mossembekker took a trip across Florida to visit a few of our clients. Here’s some insight into those visits. Starting with a visit to Doc-Solutions, Charles and Jared met with the company president, Gavin Rembach. Upon introduction, Vice President Blake Siemon from Halsey and Griffith loved umango so much, Halsey and Griffith became a reseller. RITE Technology also got an intro to umango. The team met with sales manager Wayne Parrish and Oscar Contreras, Director of IT, both of whom were equally as impressed, agreeing to present umango as the capture product. After their meeting with Operations Manager Brian Wilcox and Solutions Consultant Frank Betancourt of Seminole Office Solutions, they agreed to become umango resellers as well. The final introduction went to the President of AXSA Imaging Solutions, who agreed to sign all three of his companies with umango and Papercut. The visits didn’t stop there though. Charles and Jared also conducted sales training for PaperCut and umango, starting with WBS Technologies. This was Charles’s first sales training with the WBS teams, which ended in Charles acquiring two new PaperCut opportunities. 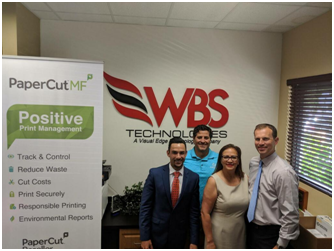 WCC Business Solutions was the next stop where Charles and Jared met with Vice President Zac Molnar for WCC’s entire sales force and leadership team training. The trip ended at Sissines Office Solutions, whose sales force and leadership teams had PaperCut and umango training. Umango was installed in their showroom, leading them to begin using umango to scan their orders. Charles and Jared’s visits were hugely successful. ecoprintQ’s goal is to ensure satisfaction and quality support for its resellers and partners. We as a company want to do what we can for our resellers and partners alike. Whether it be promoting, training, technical support, or sales support, they can always count on us. If you want to learn more about umango or PaperCut, contact sales@ecoprintq.com. Call us today at 800-236-8499 to learn more about what ecoprintQ does and how we can help you. This entry was posted in ecoprintQ and tagged ecoprintQ, ROAD TRIP, Umango by IA Staff. Bookmark the permalink. Next → Next post: Brett Butler of Excel Is Latest LD Products Winner! See What He Won!